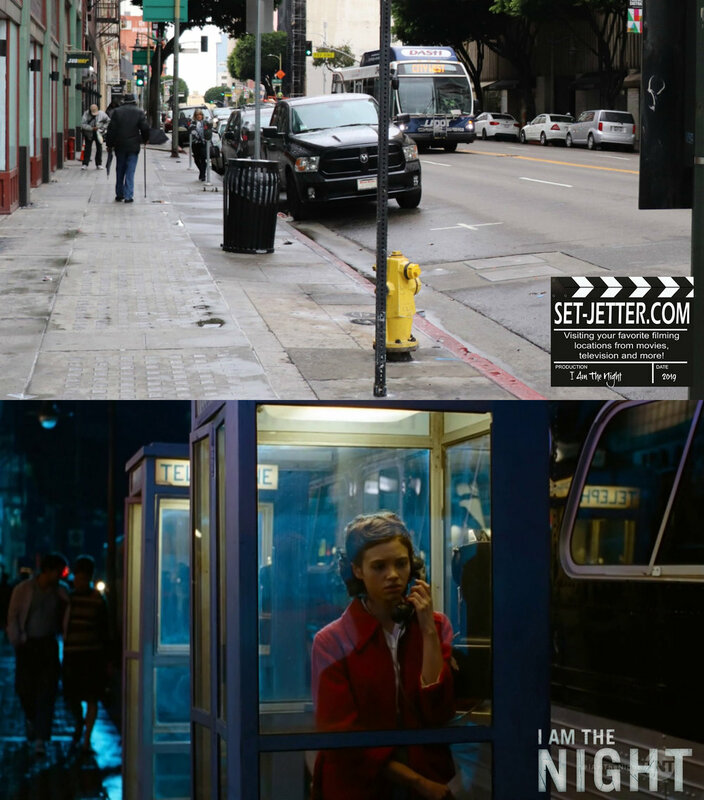 I have been anxiously awaiting the latest film on the Black Dahlia mystery. 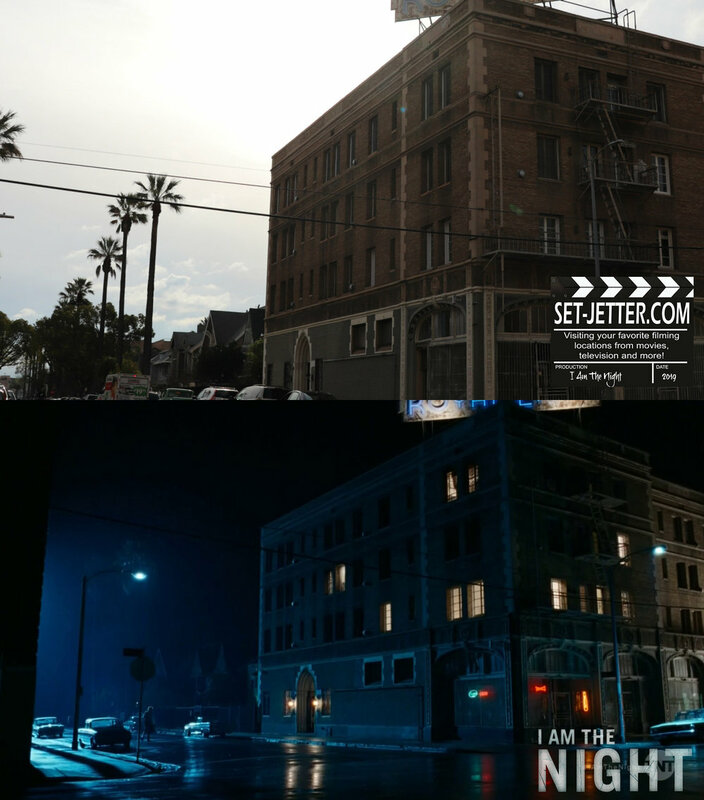 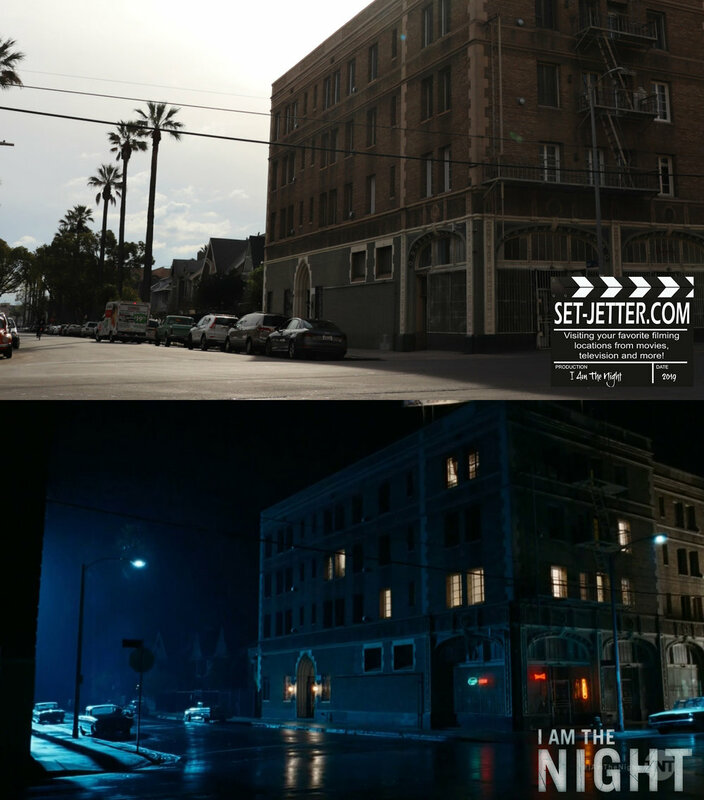 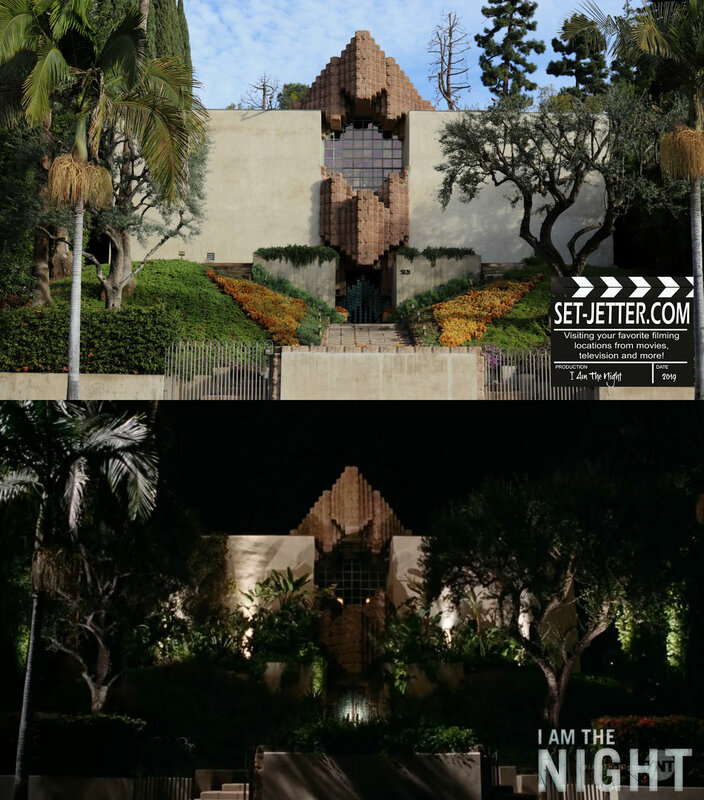 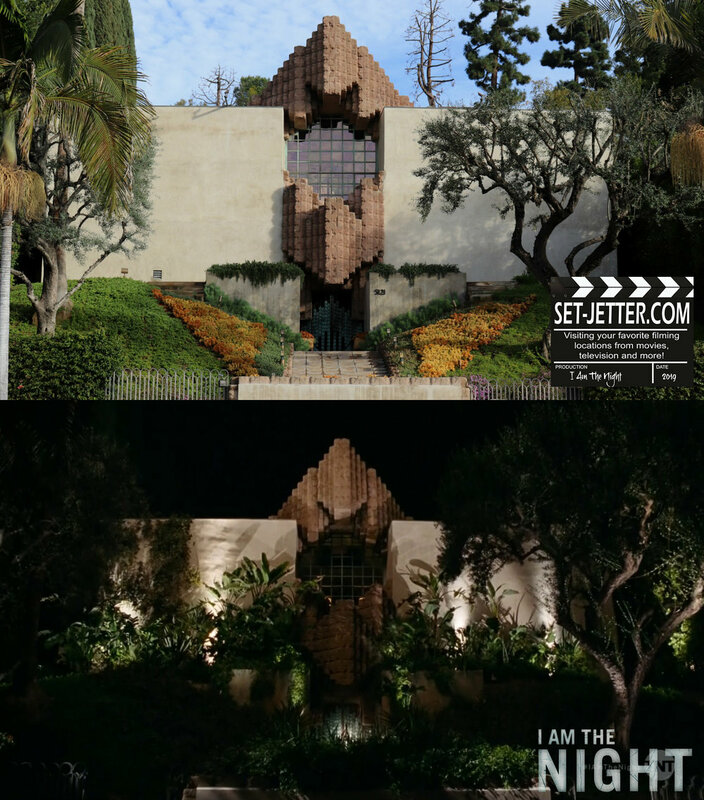 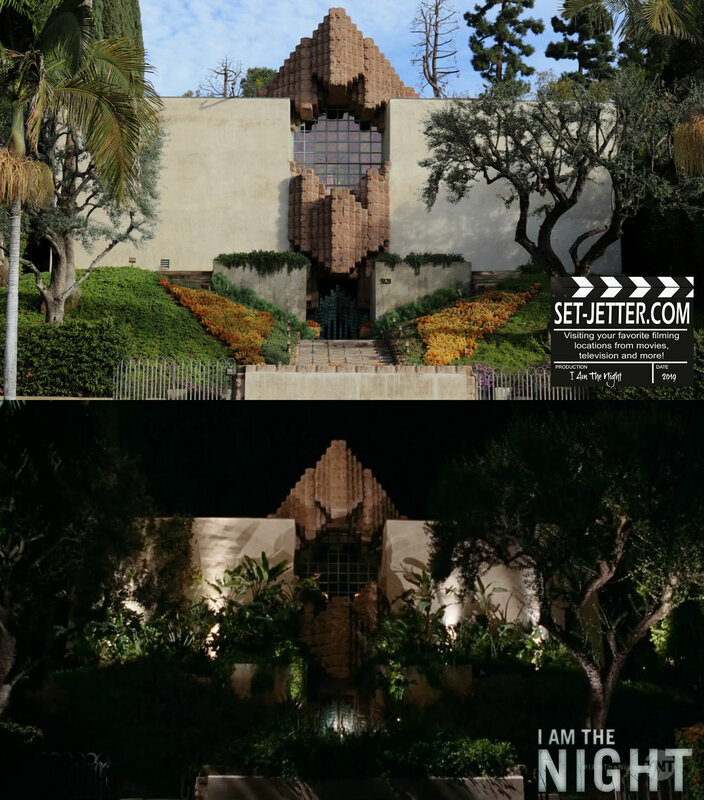 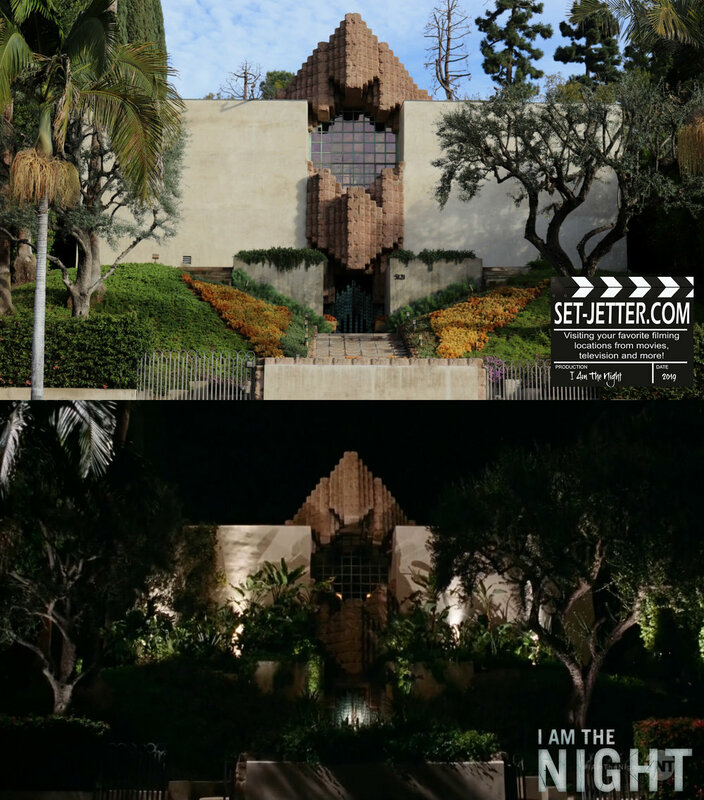 “I Am The Night” premiered the night before I left for my latest LA trip, so I was able to get to a few of the locations during my latest trip. 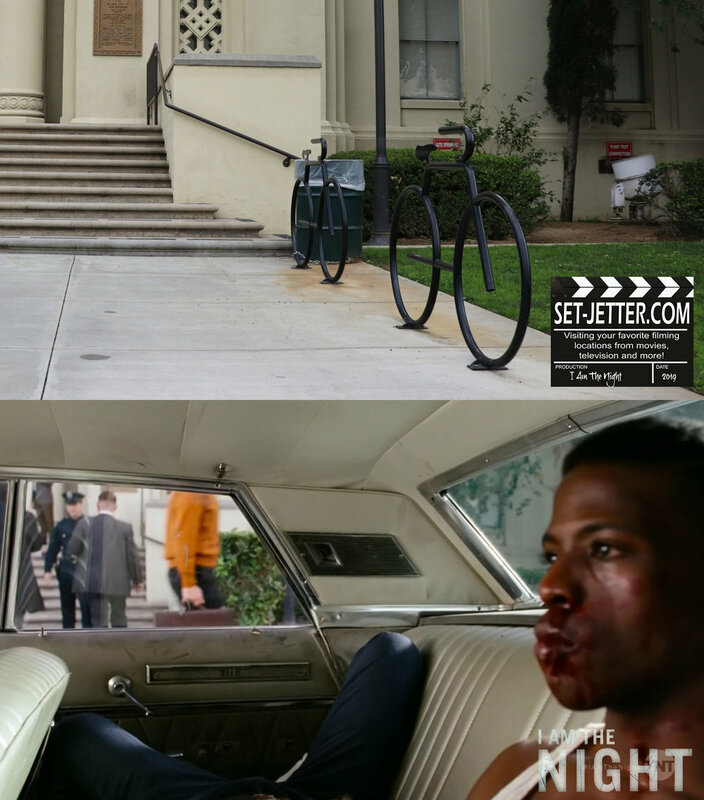 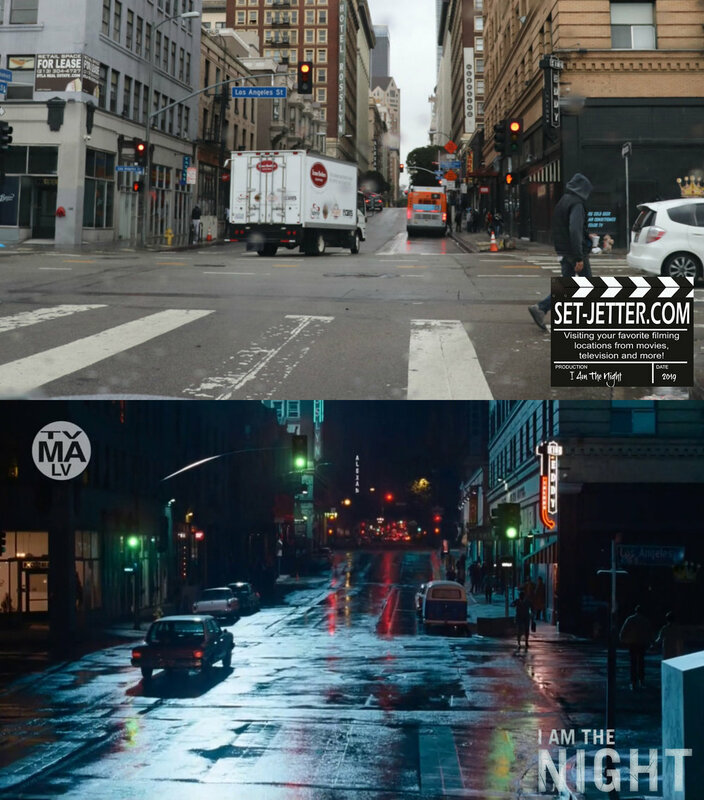 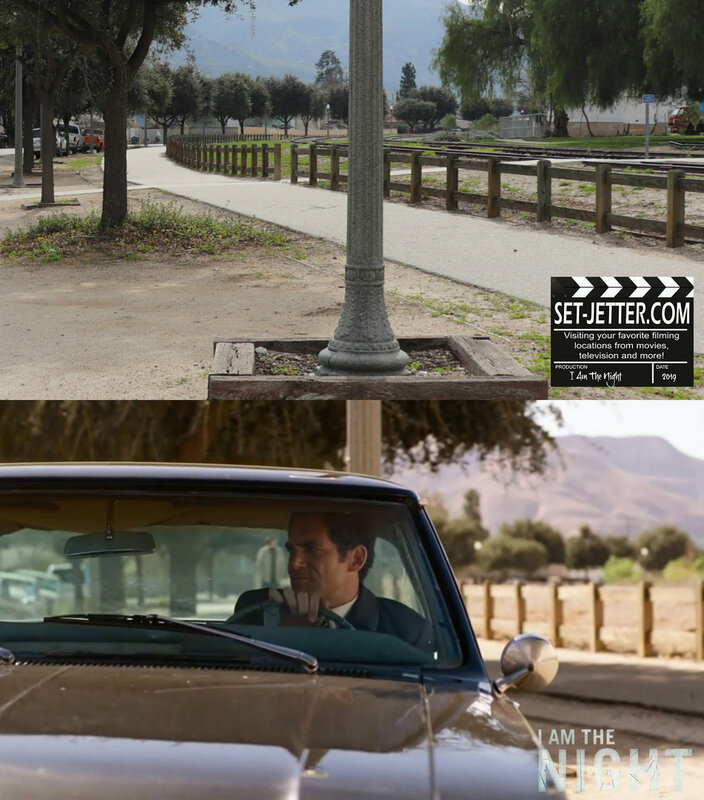 Below are locations from the pilot episode. 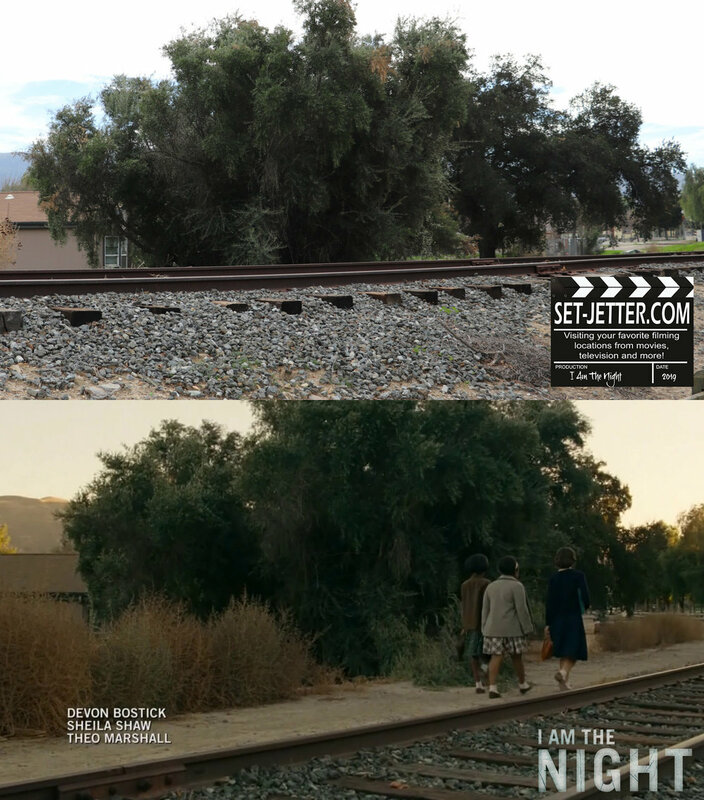 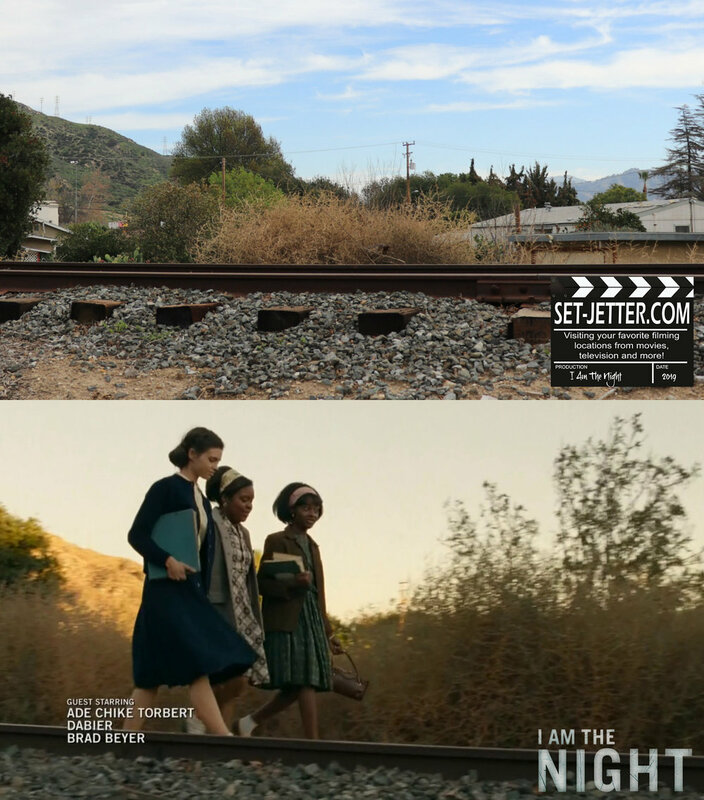 The film begins on these railroad tracks right off Center Street in Piru, California. 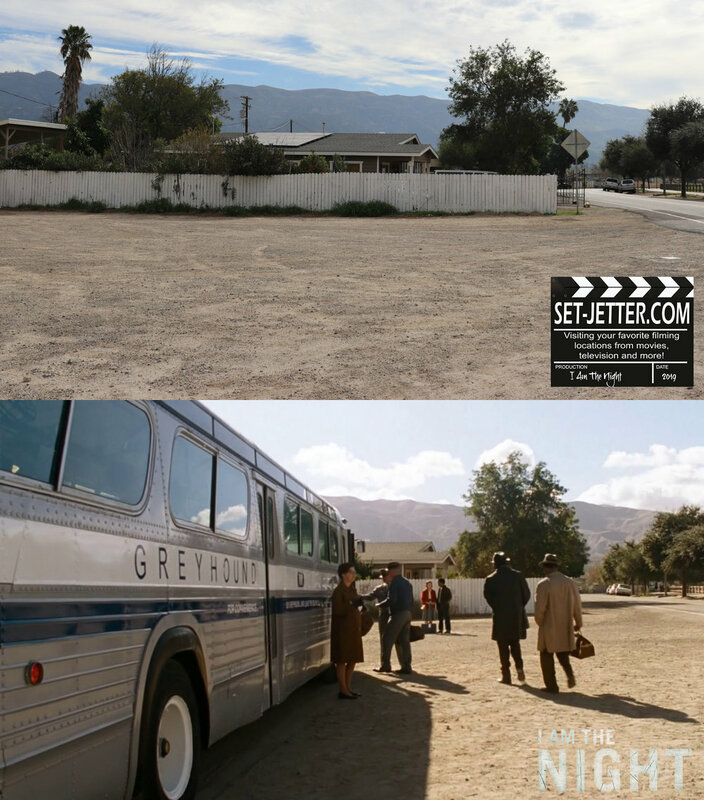 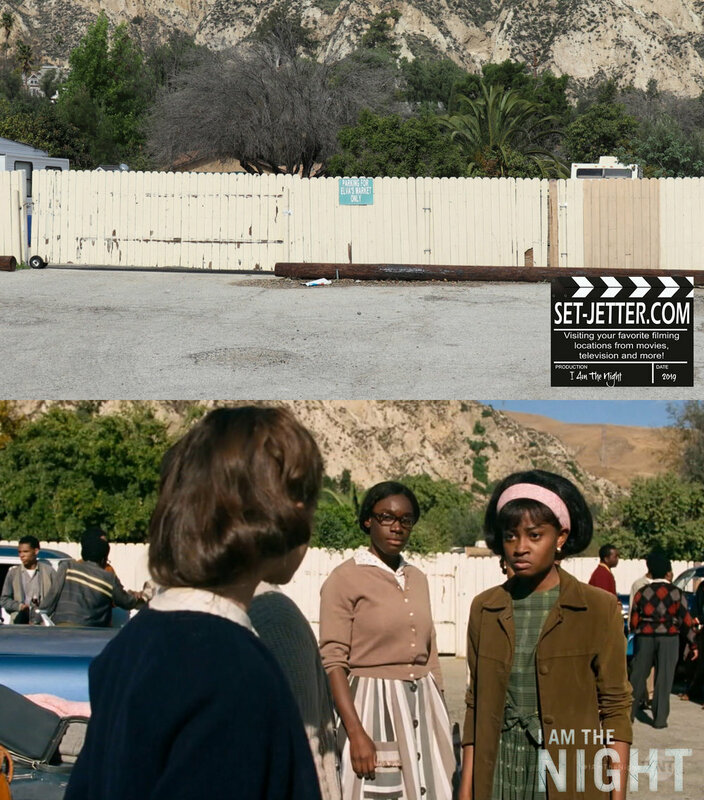 This spot was also used a couple years ago in Pee Wee’s Big Holiday. 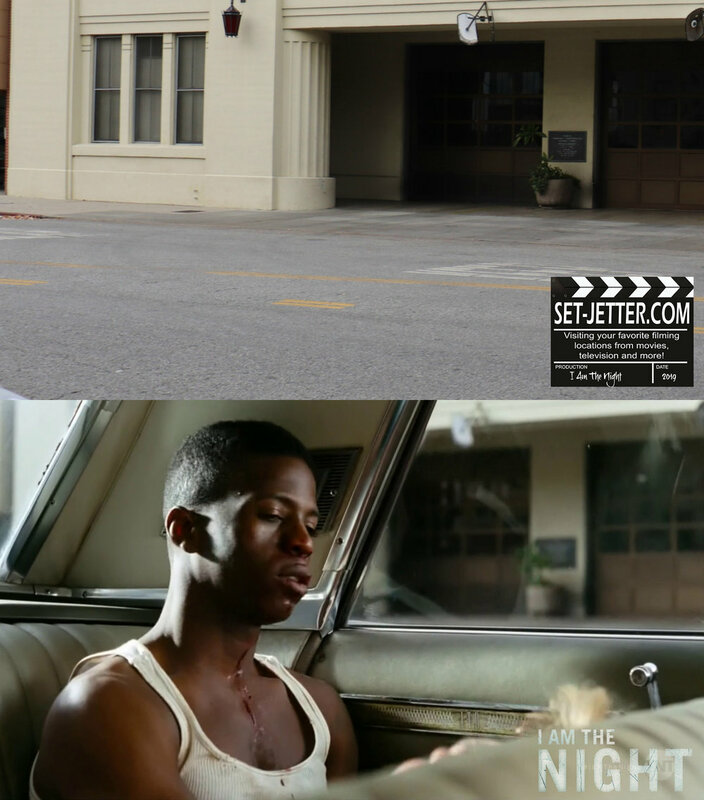 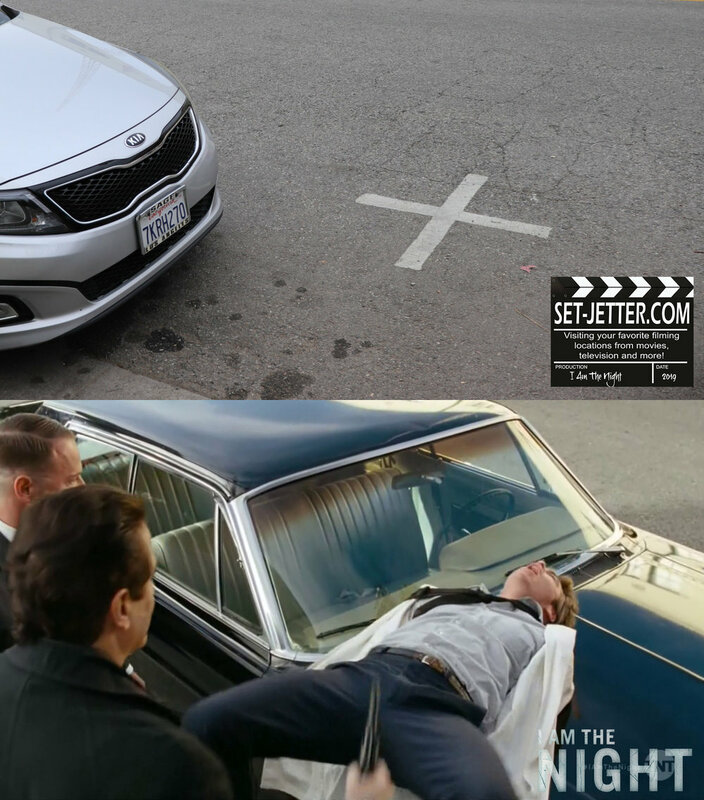 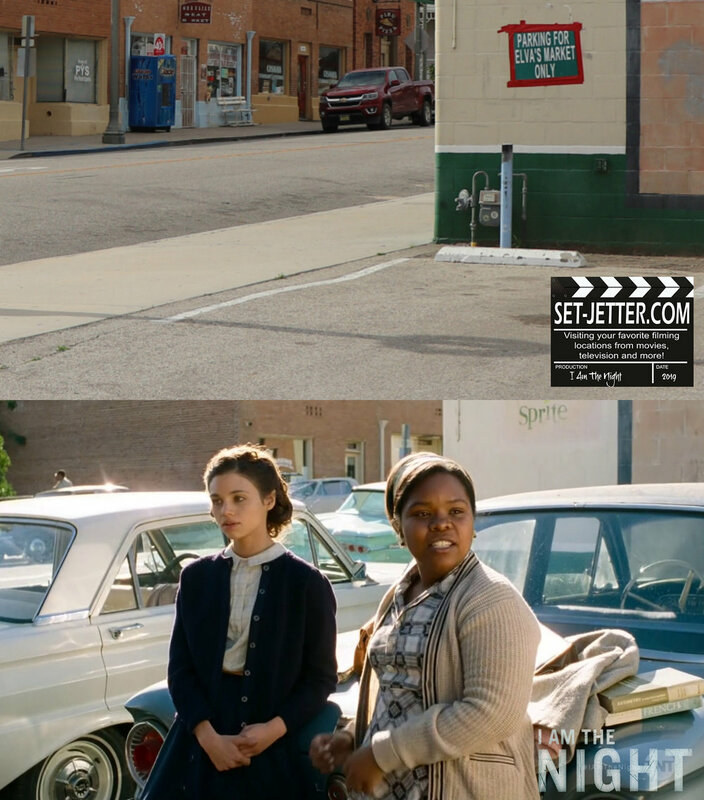 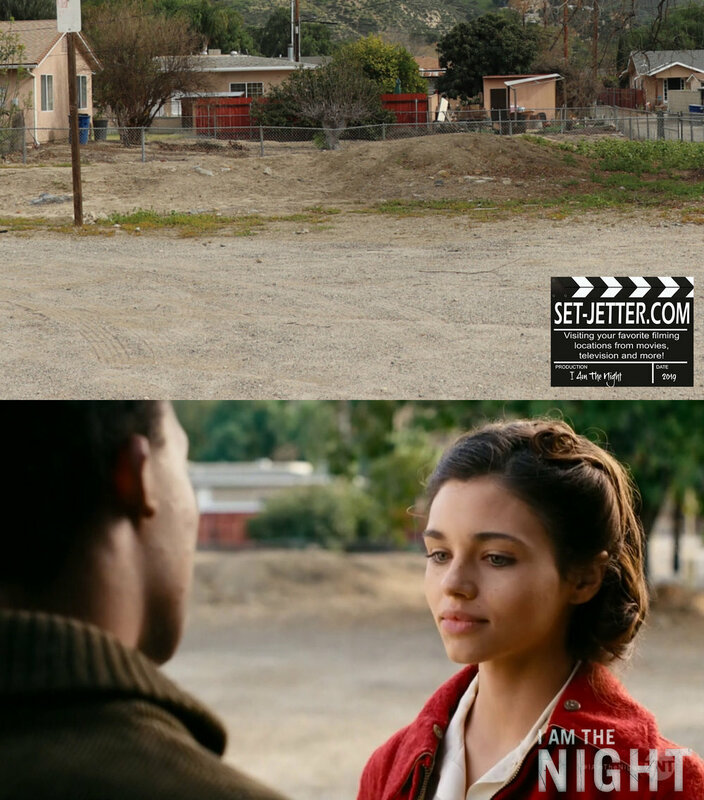 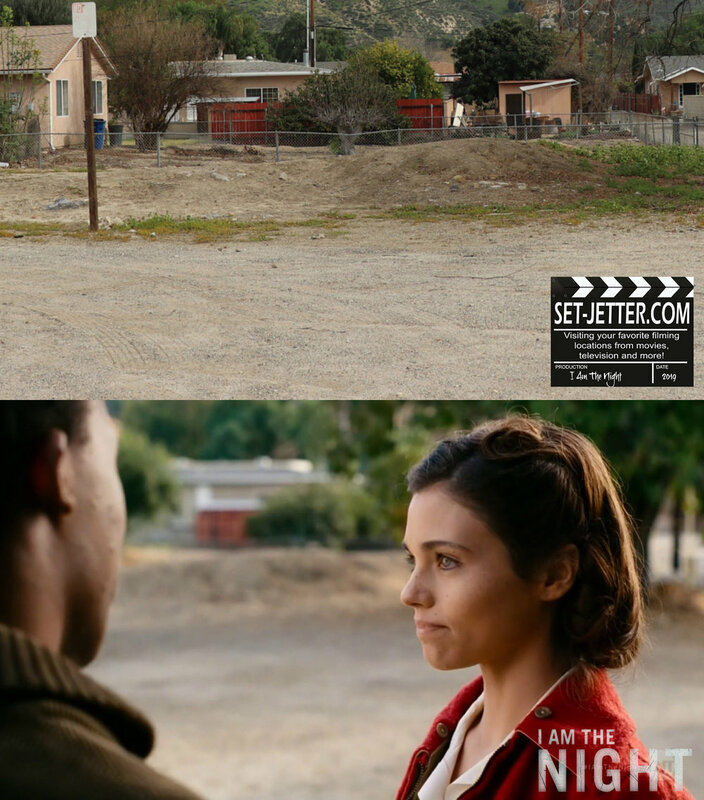 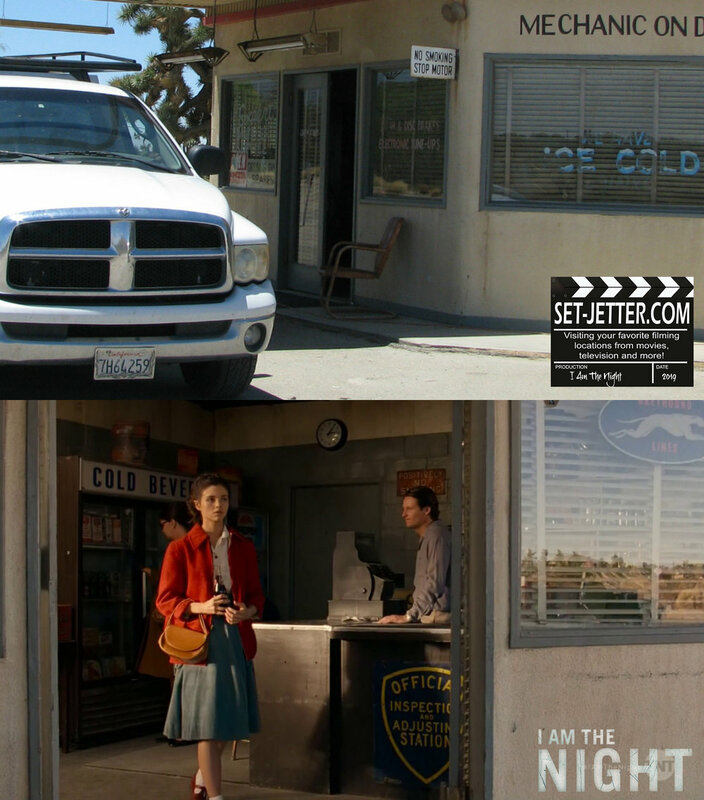 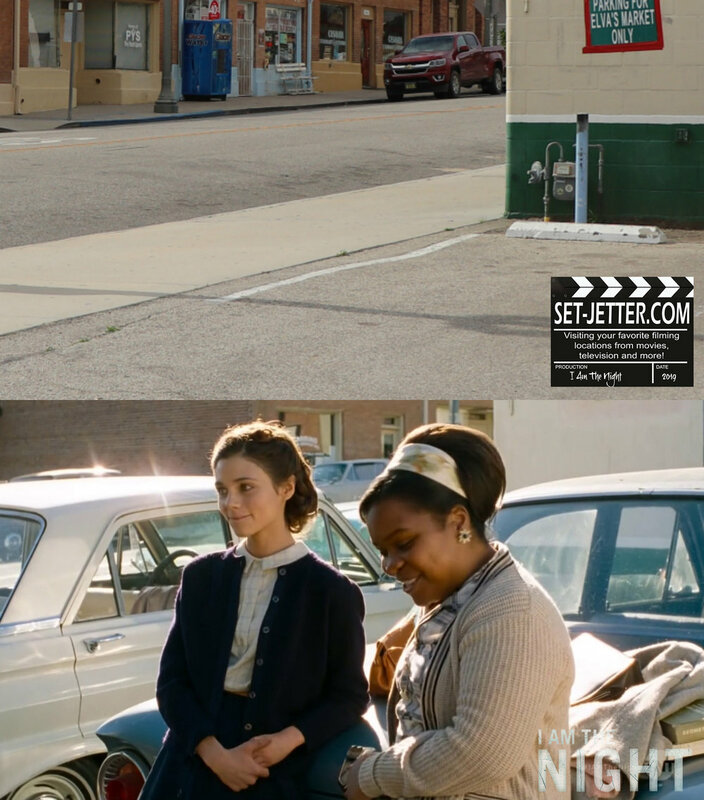 The next scene takes place right next to those railroad tracks in the parking lot of Elva’s Market at 3969 Center Street in Piru. 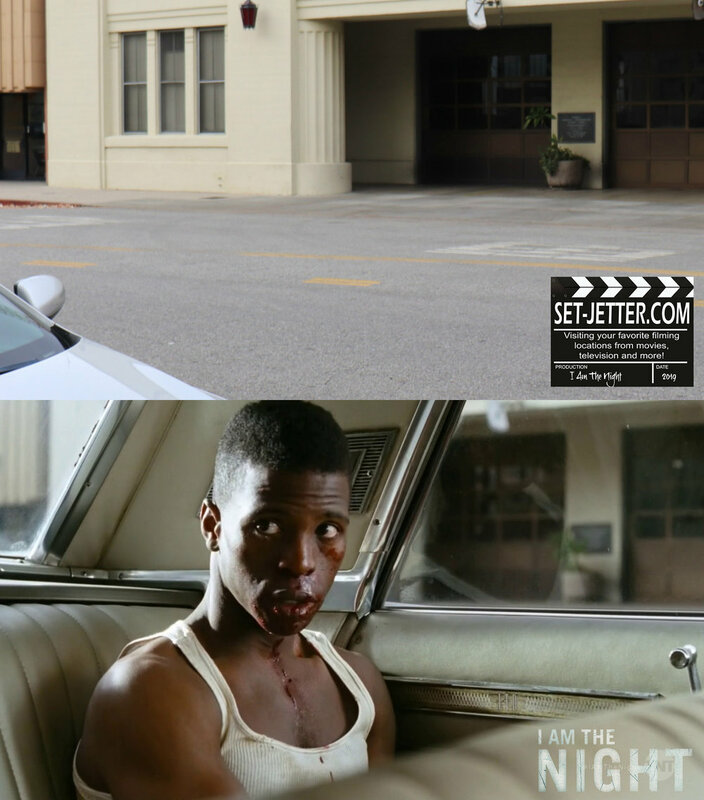 Piru has been used in countless films including Twilight Zone: The Movie, Cobra, Return of the Living Dead, and more. 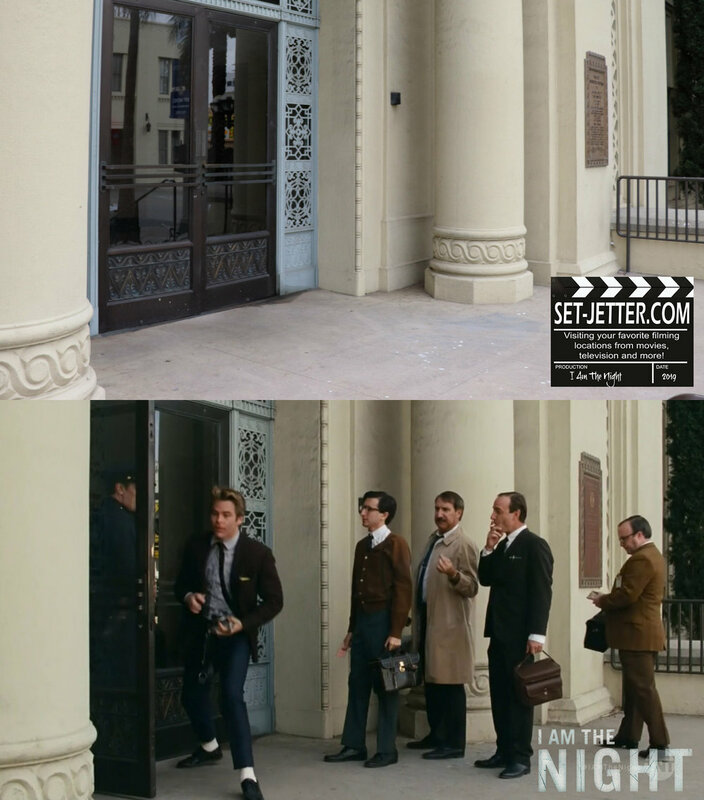 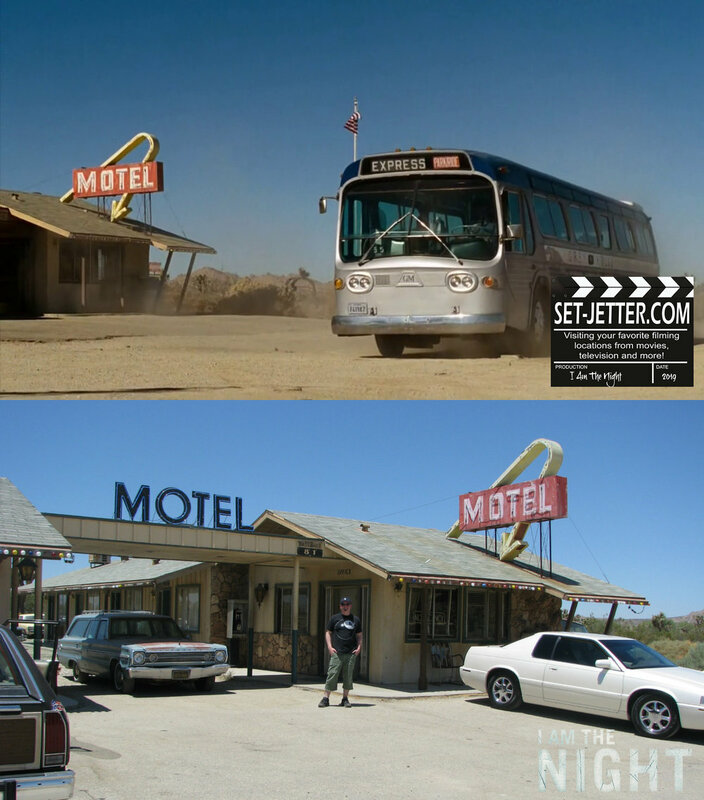 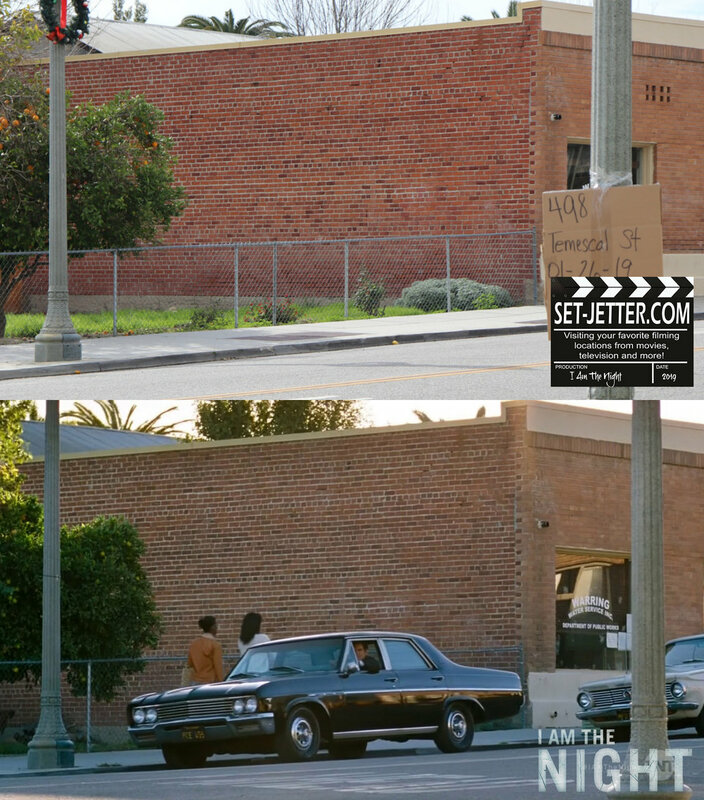 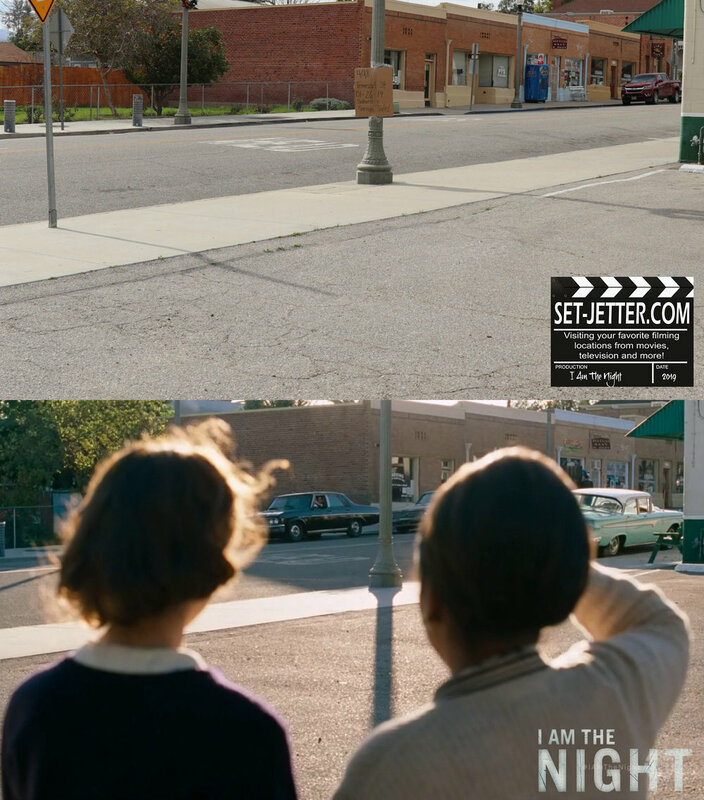 The production either took down or CGI’d out the modern signs and poles. 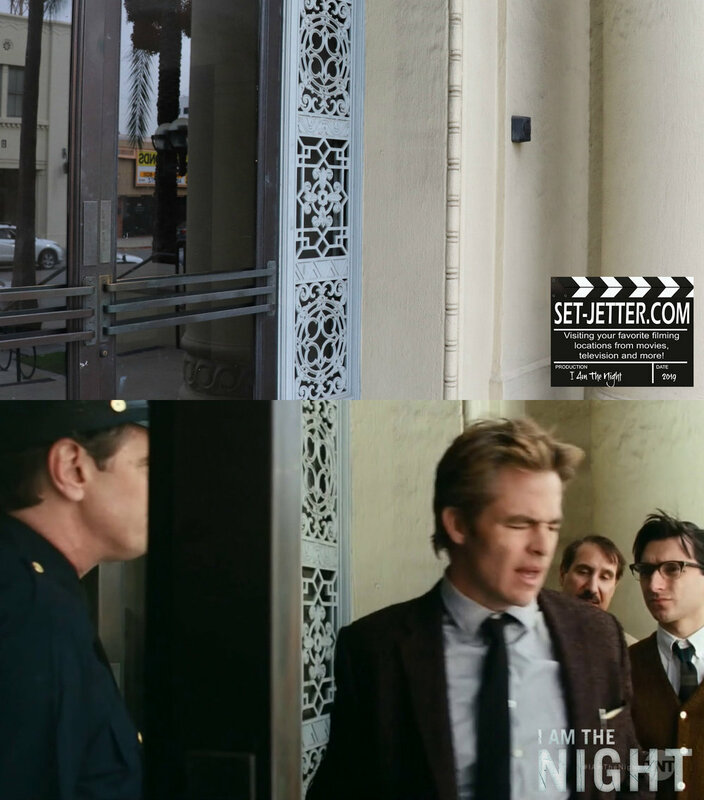 Chris Pine parks at the corner of Los Angeles Street and goes into the King Eddy bar at 131 E 5th Street in downtown Los Angeles. 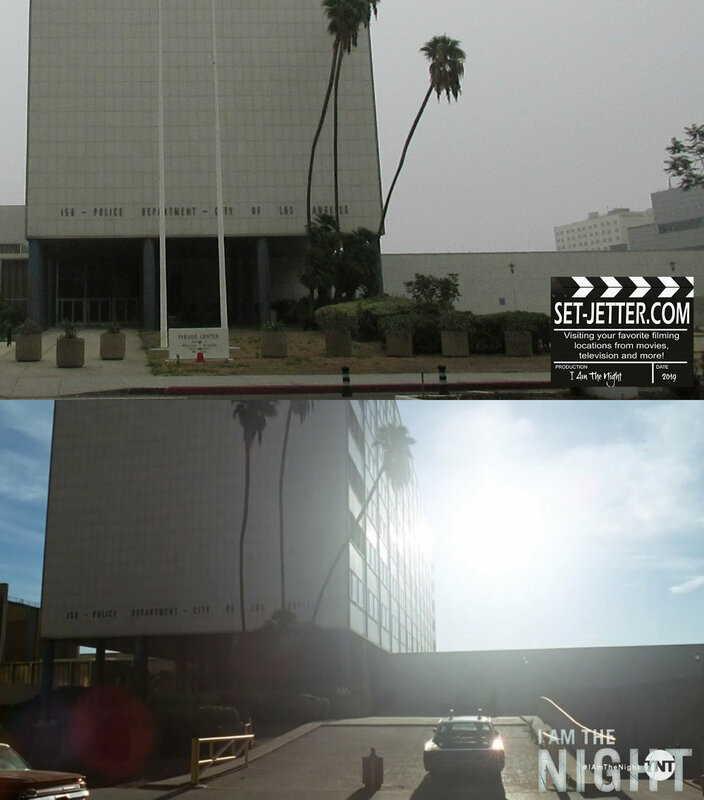 Next up is the hospital played by Van Nuys City Hall, located at 14410 Sylvan Street. 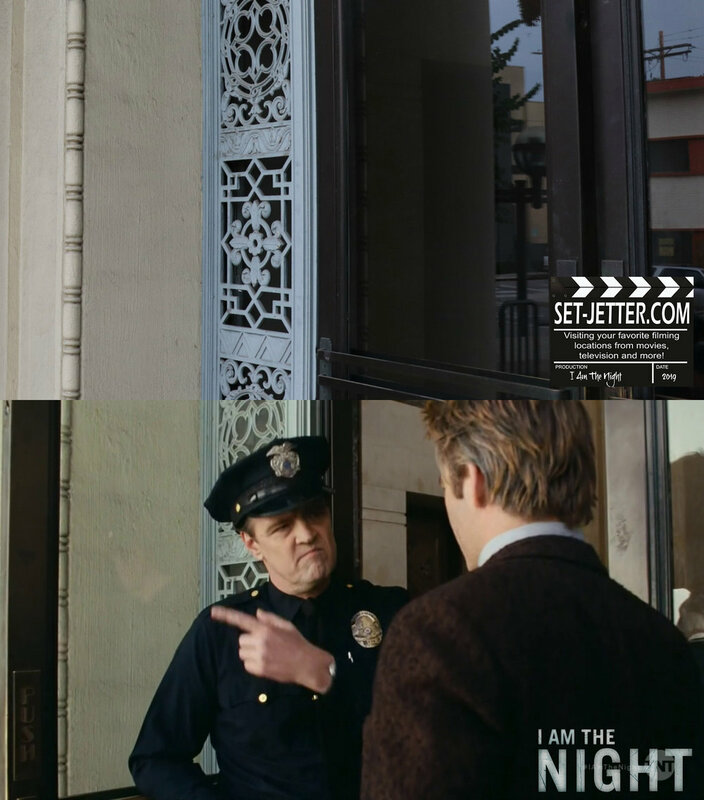 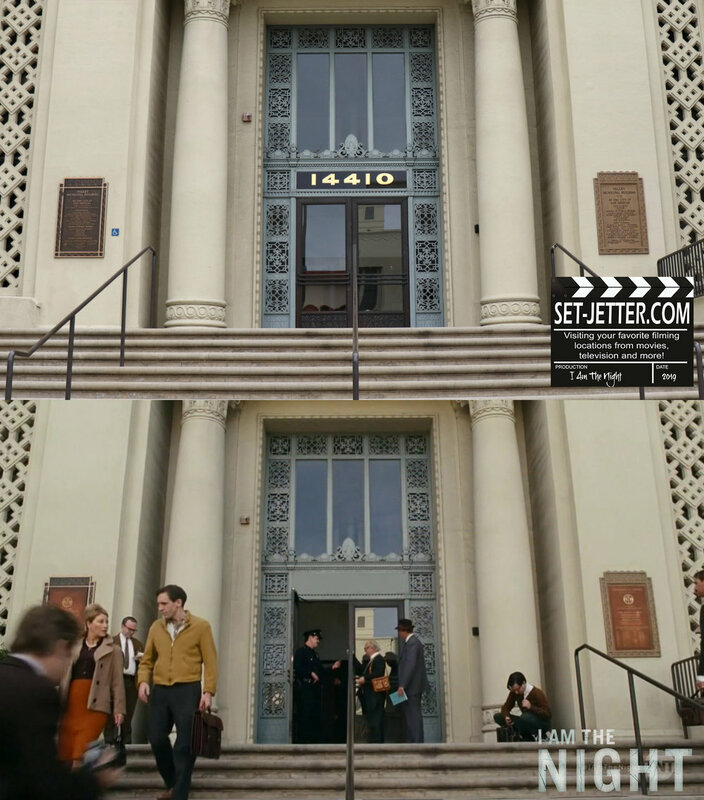 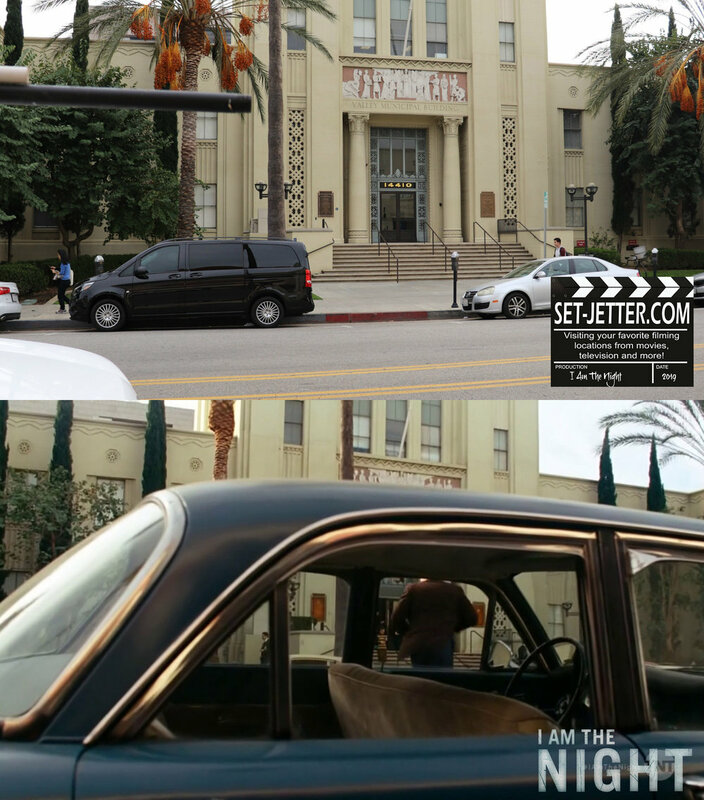 I didn’t revisit the next location but here are somewhat matching shots of the old Los Angeles Police Department Parker Center located at 150 N Los Angeles Street. 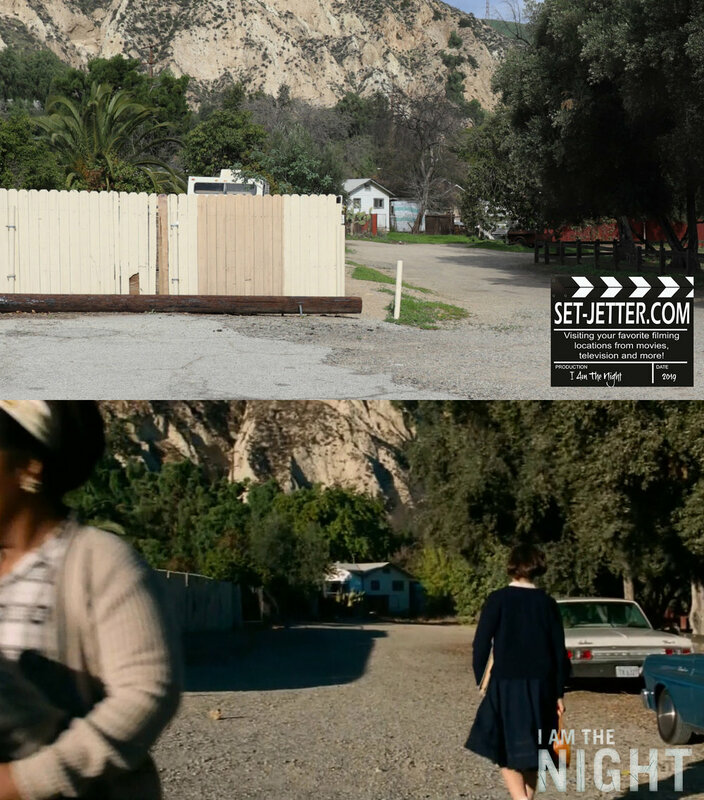 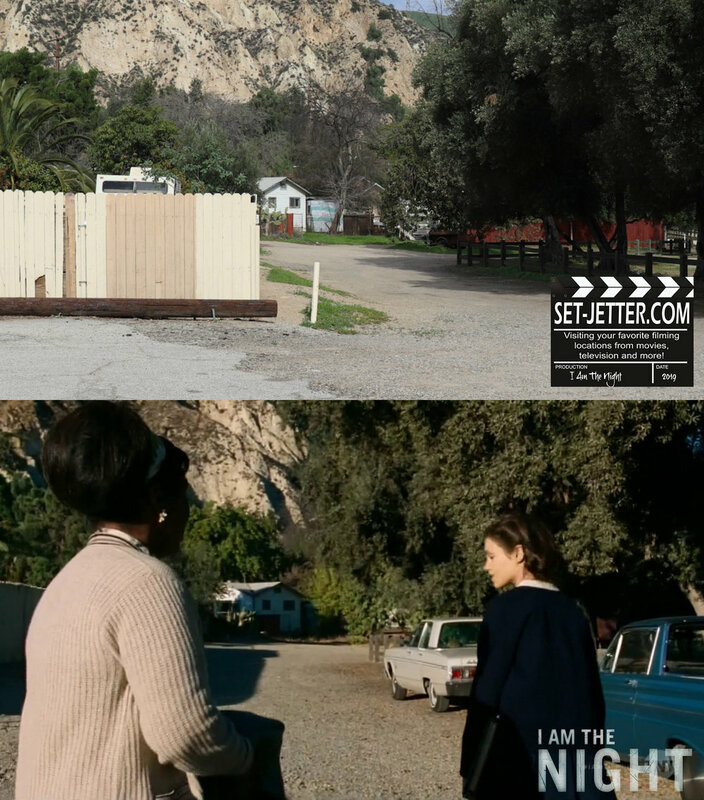 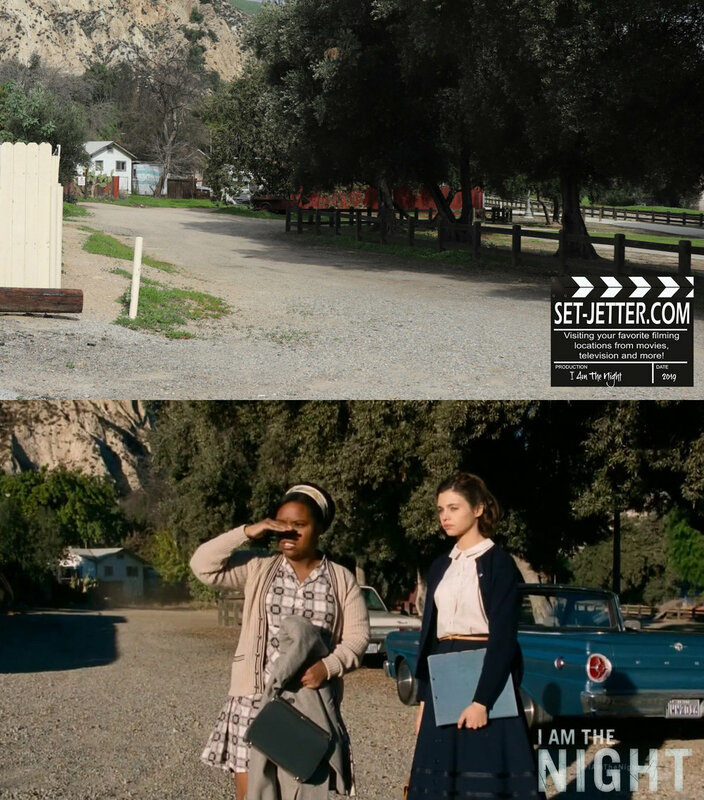 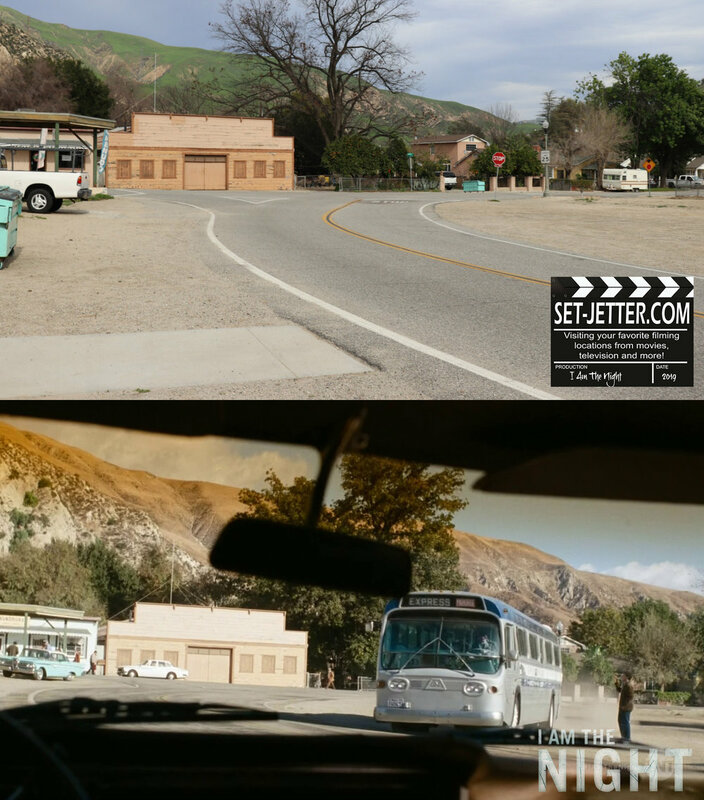 It’s been many years since I’ve been to the Four Acres movie ranch, but found a few shots that matched up. 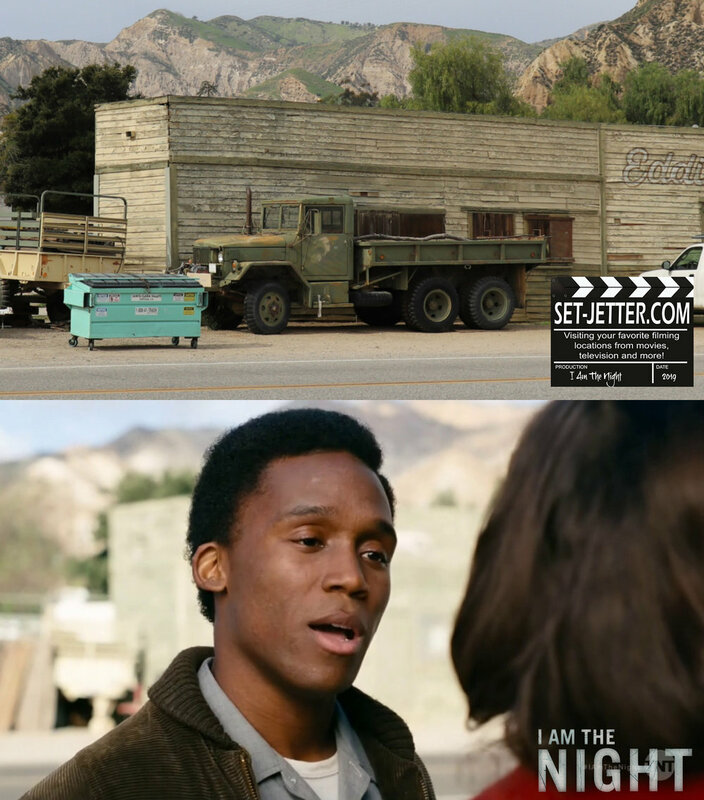 It is located at 14499 E Ave Q near Palmdale, California. 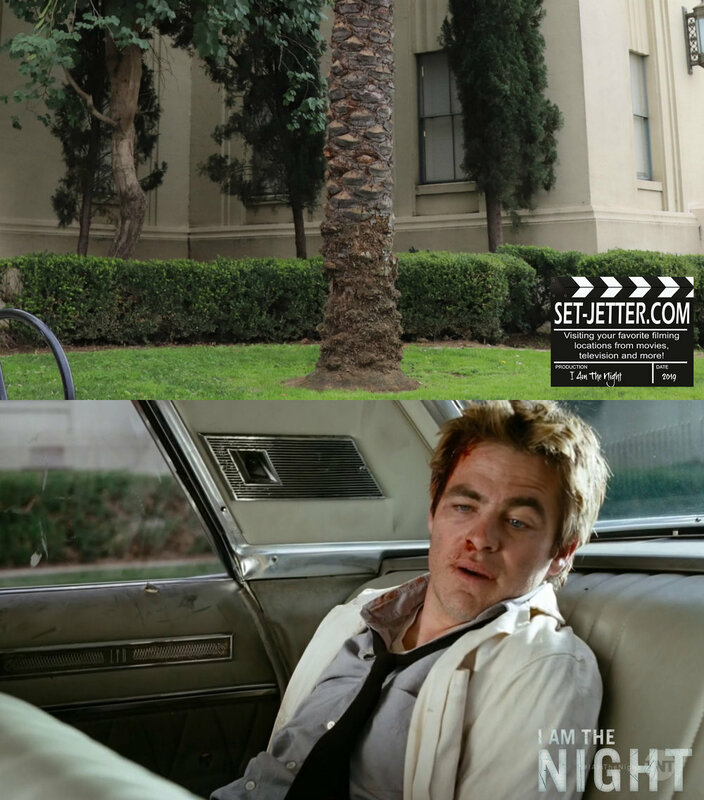 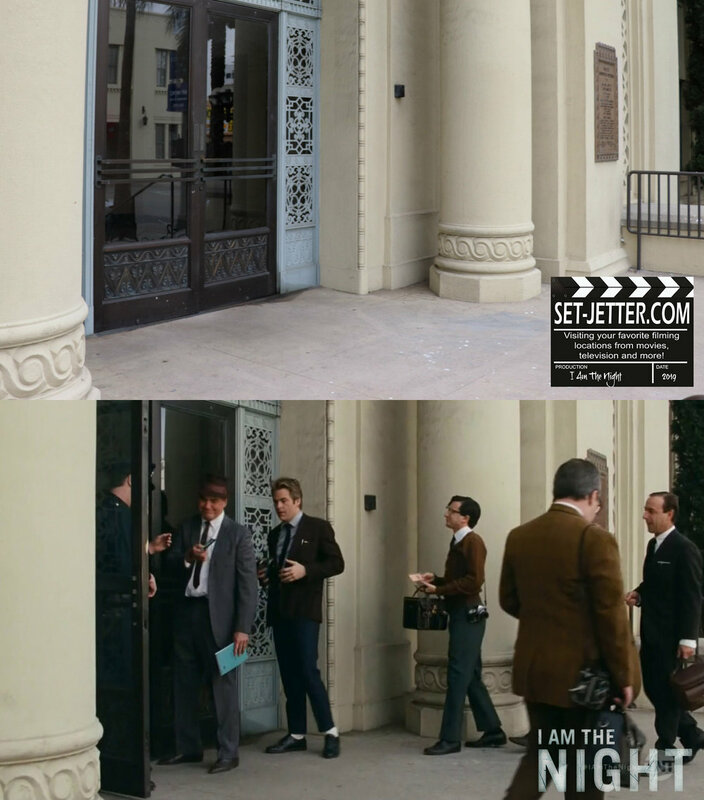 Chris Pine’s apartment is the Royal Lake Apartments located at 1109 S Lake Street near downtown Los Angeles. 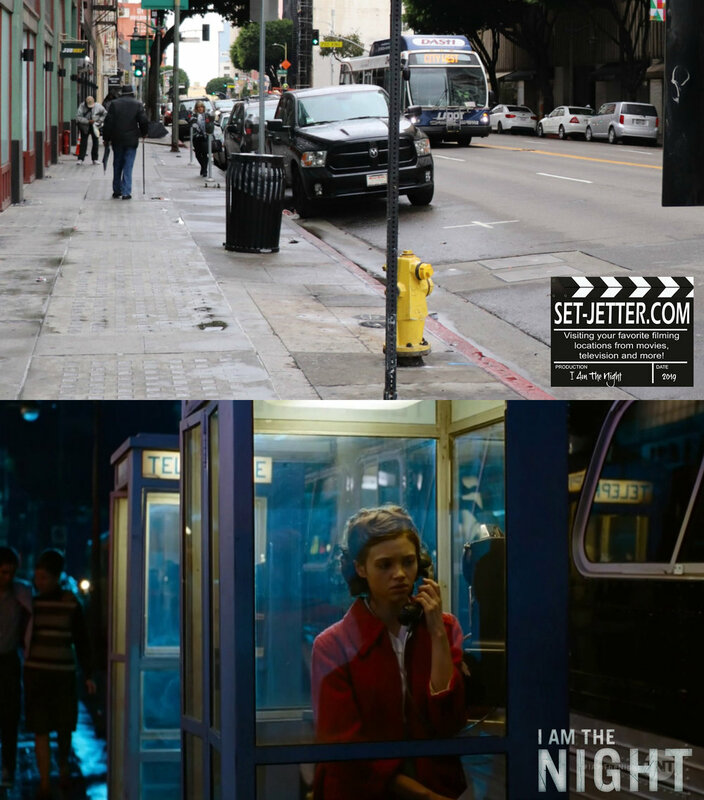 The bus depot is located near the corner of Los Angeles Street and East 7th Street. 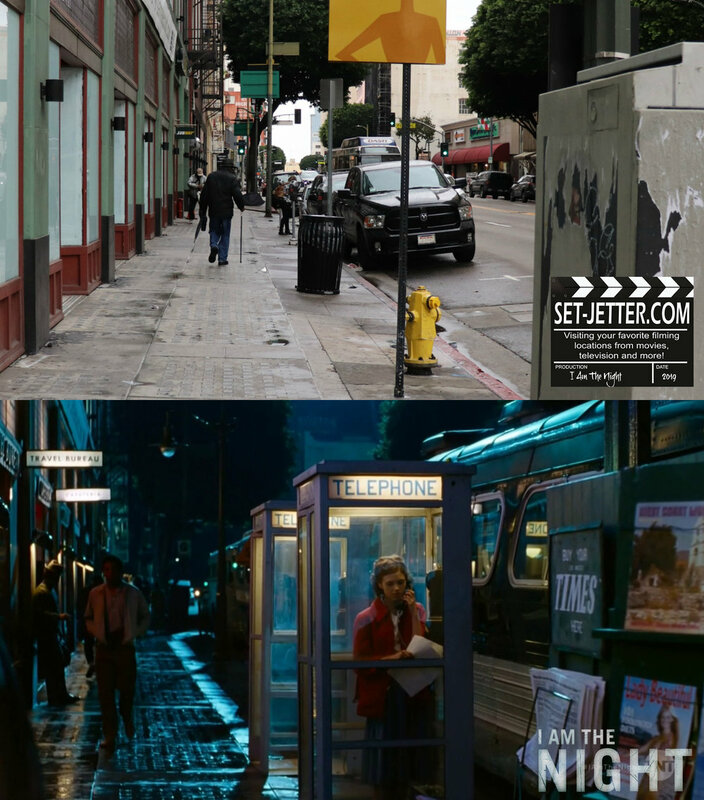 The phone booth was located in the storefront at 702 S Los Angeles Street. 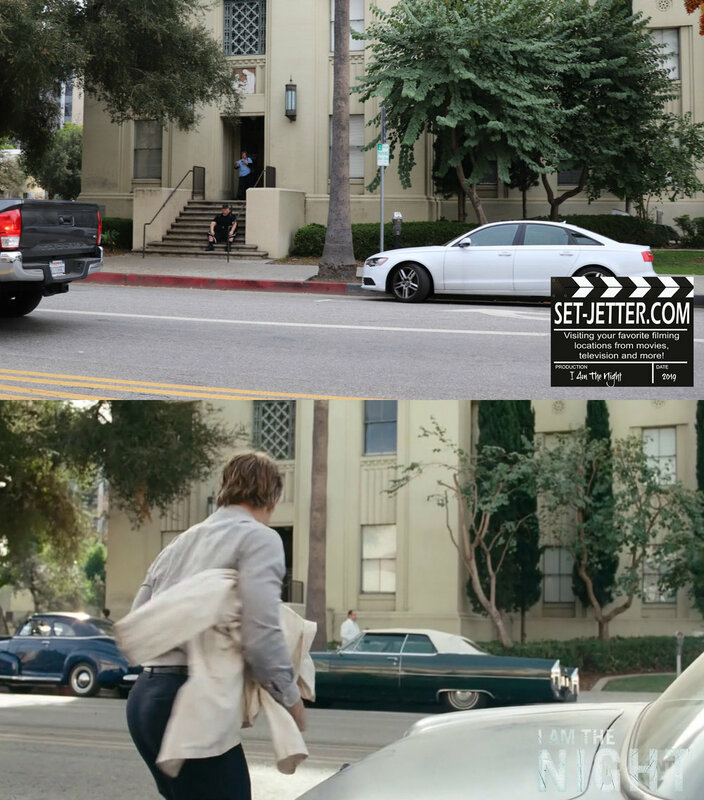 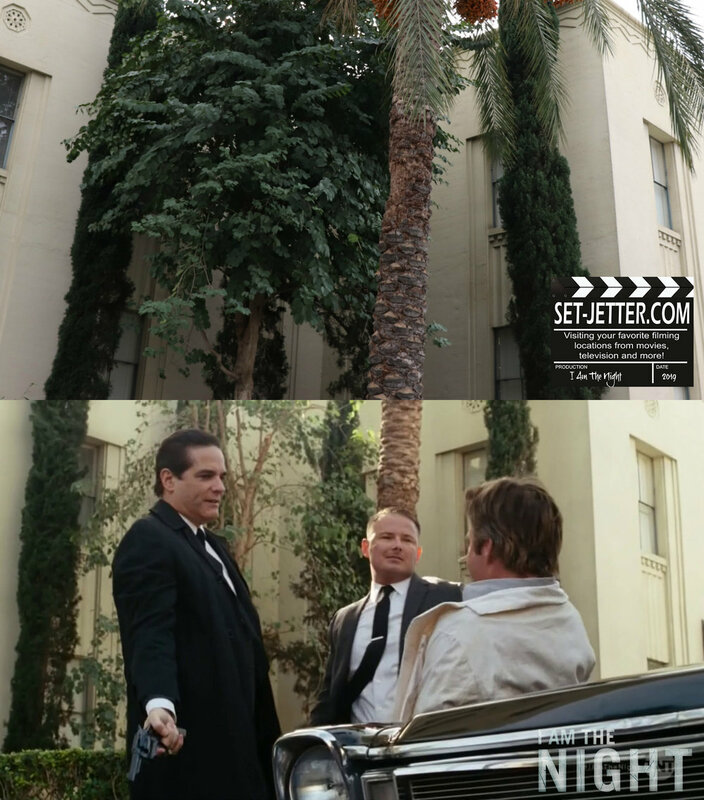 And finally we get the first shot of the John Sowden house, located at 5121 Franklin Street in Los Angeles. 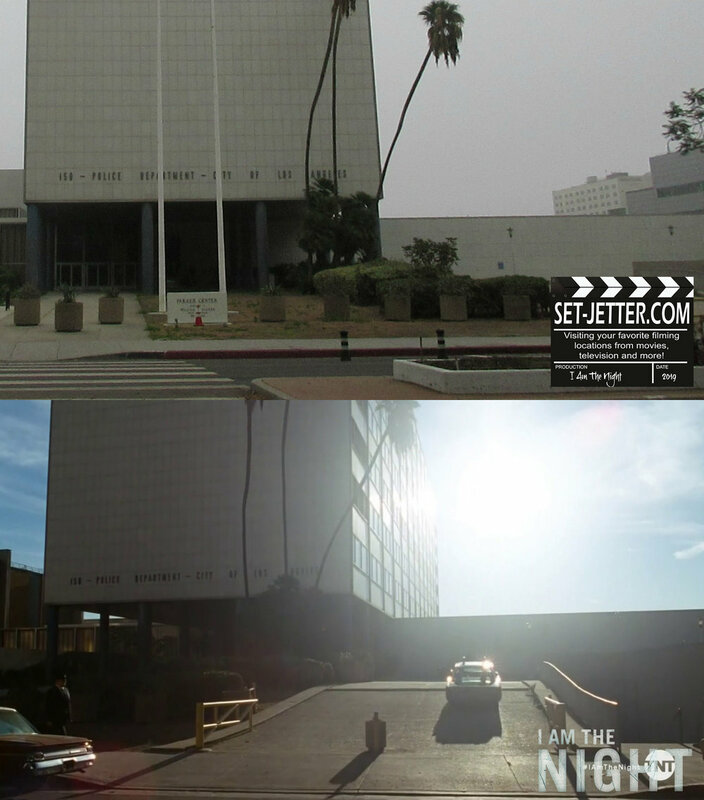 Those are the locations I was able to visit or previously visited. 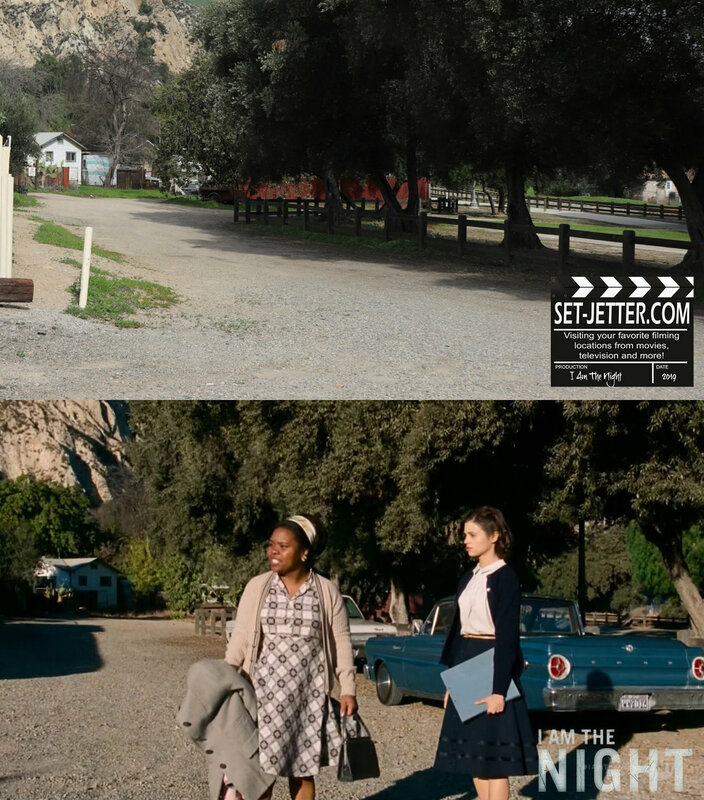 Because of all the rain on this latest trip, I wasn’t able to get to the beach scenes, but that beach house was located at 33602 Pacific Coast Highway in Malibu. 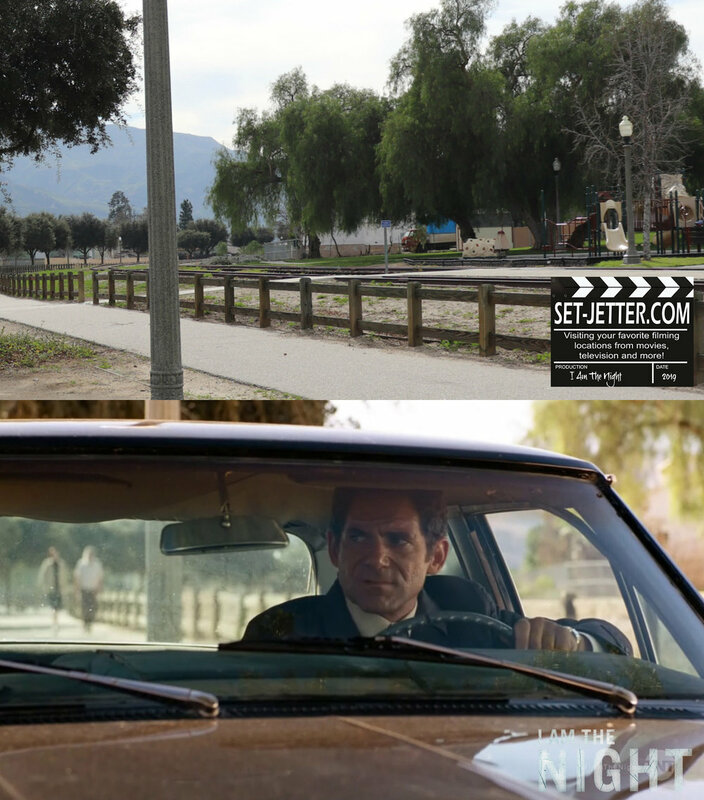 He makes the phone near the Malibu Pier in a parking lot located at 23200 Pacific Coast Highway. 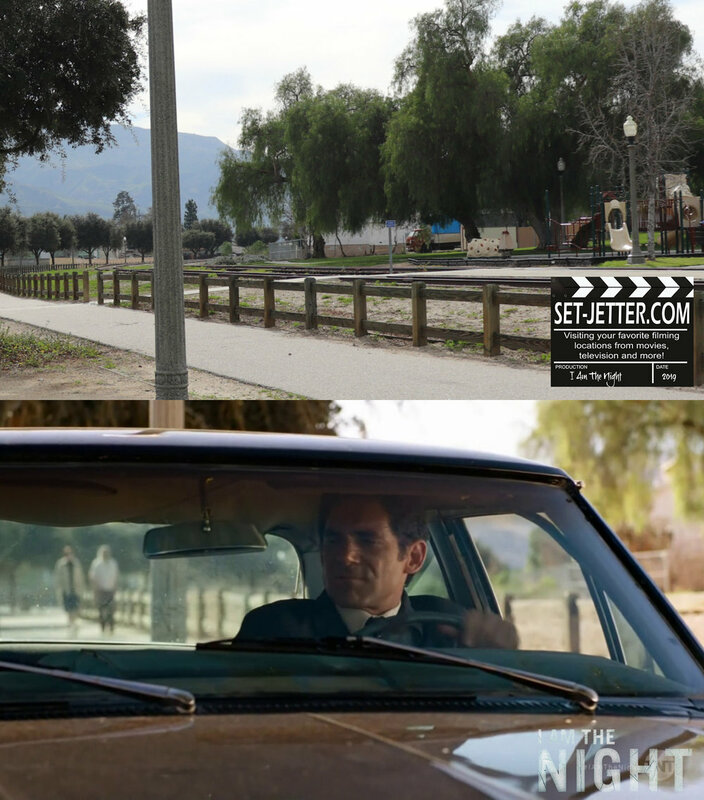 Stay tuned for more locations from the mini-series!